Nigerian Magazine: Road To General Elections 2019: Who Is Afraid Of The Inspector General Of The Police...And Why? 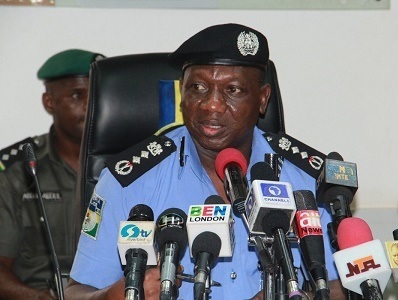 Road To General Elections 2019: Who Is Afraid Of The Inspector General Of The Police...And Why? Are you an active observer of happenings in the Nigerian political scene? The next coming weeks should be particularly thrilling because a storm is brewing and this one would be political drama for the ages. What do you make of the 11-point joint session resolutions issued by the National Assembly to President Muhammadu Buhari on yesterday, June 5th, 2018? In their characteristic manner, Nigeria's apex lawmakers had an emergency tete-a-tete amongst themselves and the outcome? An eleven-point ultimatum was handed to President Buhari to summarily dismiss the Inspector General of Police or face the full wrath of their constitutional powers aka impeachment. No political observer saw this one coming, everyone had been blindsided by the presidential assent of the 2018 budget (a story for another day) comical. Many questions are running wild in the minds of political observers but the main one is, why did the National Assembly single out the Inspector General of the Police for the sack if all of the security agency heads must be fired for stemming the spate of killings across the nation? Why the sudden intensity for the call for IG Ibrahim Idris' sack when the Police are investigating various lawmakers for different allegations across the nation? Who is afraid of the Inspector General of Police less than a year to the 2019 general elections? If truly the lawmakers know the IG of Police is doing nothing other than presiding over the killing of innocent Nigerian and consistent framing up of perceived political opponents of the President, why wait 3 years before they do their job? Is it because the Senate President himself fears the possible indictment from the outcome of the conclusion of investigations of the Offa robbery suspects confession statements? If truly there is systemic harassment and humiliation by the executive of perceived political opponents, people with contrary opinions including Legislators and Judiciary by the police and other security agencies, why not speak up earlier? It is apparent they are two sets of laws in Nigeria; one for the rich and another for the masses and downtrodden. For weeks Nigerians carried out and sustained the #EndSARS campaign about police brutality and extortion without a word from the National Assembly, the moment one of their own got arrested the lawmakers are threatening President Buhari with impeachment. Are the lawmakers trying to make President Buhari bend the rules to favor them on the road to 2019? Is the National Assembly’s call for the IG of Police’s sack altruistic or another exercise at covering their exposed flanks? What do you make of this latest development?